Holy Chocobo! We're in the home stretch of FFV! Let's pause a moment to ogle the closing FMV from the PS1 version. 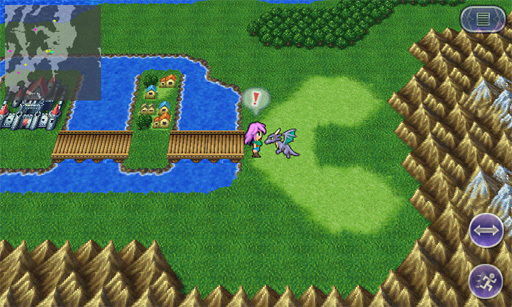 It's a fine recap of some exciting moments in the game: pyromaniac Exdeath setting the Moogle forest on fire around the Guardian Tree, Galuf's attack on Castle Exdeath thwarted by the barrier and his friends showing up to spoil everything, Krile on her trusty dragon seeking the perpetually lost party, Faris losing her beloved Syldra the Sea Dragon all the way back on Disc One, the shade (?) of King Tycoon playing hide-and-seek with us, the Lonka/Ronka ruins flying up into the sky, and a couple endgame battles we still have to look forward to (or flee, if we have any sense). Symbolism ahoy! I've totally lost track of which crystal / element / attribute goes with what in this FF installment, and I don't know why I care, but I'm puzzling over them, particularly hope = fertility? I also marvel at how quickly graphics look dated, and how awesome Faris and Lenna look in trenchcoat and court attire with matching katanas. Welp! Back in the "Let's Play Final Fantasy" saddle after a real life "ack, the 'rents are visiting!" hiatus. As per Galuf's last wishes, it's time for us to launch his long-delayed assault on Castle ExDeath. 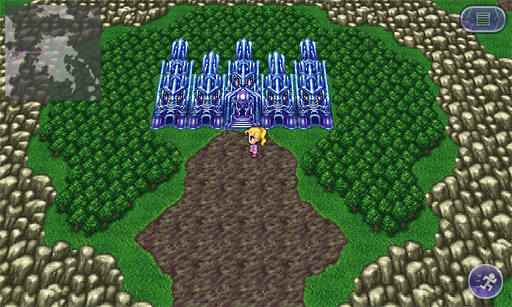 I would pretend that this is the endgame, except that I've played FFV before, and cannot help but be aware that this is really the "Let's go to Zanarkand / City of the Ancients / Lunatic Pandora / OOPS there's more plot" dungeon. Still, here we are. Final Fantasy V Recap, Ep. V: "Of Hell's Bells and Galloping Galufs"
Hooray! We've landed in another world to help our friends, and have promptly been captured and imprisoned! Aren't we clever Warriors of Light? We're giving Firion a run for his money! So our four heroes have been drafted as the Warriors of Light (WoLlies really need to form a union) and are off to the next Crystal, as soon as we can escape the Kiddie Pool Inner Sea. Final Fantasy V Recap, Ep. I: "Of Ham & Cheese"
Dear Squeenix, when you turn Amano's concept art into 3D, you do not have to leave their skin the color of a piece of paper. It's amazing how quickly graphics look dated, isn't it? But Uematsu's music still soars. I adore the outrageous spines and jewels sticking out of everything, especially that pirate ship. Black trenchcoat? Check. Katana? Check. Bishie badassitude? Check. Sephiroth, you are a cheap imitation of the ORIGINAL appearance of this character design. Nyah nyah. Okay! Time to break open the iOS remaster, whose retro Amano concept art caricatures clash crazily with stretched chibis.I'll be borrowing some original-game graphics from videogamesprites.net for commentary, because I love 'em. Note: Boldface is actual game dialog, non-bold is my paraphrase, or...er...embellishments. See below for WHY I have this dilemma. Which Final Fantasy V should I use for my playthrough? It's got the giddy GBA script which I love (a sample of which is in my userpic). The Playstation translation was flatter than Yuna's voice acting. When I played originally, I had a copy of the GBA script next to me to reread all the lines. But it didn't include NPC dialog. It will allow me to screencap, as opposed to sticking a camera in front of my TV. Extra job classes and a bonus boss (this is not so important to me). 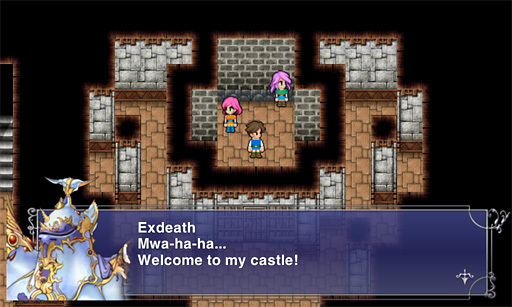 Characters: Faris, Hydra, Lenna, Bartz, Galuf. Summary: Our would-be heroes scale the Wind Shrine and pick up a pocket of trouble. The pirate discovers a madness to the princess' method. Also, snakes. Why did it have to be snakes? Chapter 3 -FFV Fanfic: "The Princess and the Pirate"
Summary: Petitioned by Princess Lenna for safe passage, Captain Faris agrees to deliver the headstrong princess to the Wind Shrine in one piece... the better to reap a reward. "The Princess and the Pirate"
Summary: A gallant pirate, a headstrong princess... haven't we been down this archetypal garden path before? Er, wait... uh...erk? Note: This story is Amano's fault. Well, no, this subtext was jiggling at me during the first hour or so of gameplay. But still, I blame Amano. Dangit, Amano, you are SO NOT HELPING. So, keeping with my tradition of being the last person on the planet to play good games, I picked up Final Fantasy Anthology for $10. Of couse, FFVI is the good game of the two on that two-game set. However, I'm playing FFV first, since this is just something to do while pedalling on an exercise bike. Perfect for that. Why doesn't Captain Faris have a fan following? I guess the rest of the game is so short on characterization and plot that it's mostly for game mechanics fans, but this character needs more love. I think Faris was reborn as Lightning Farron. A pity the fake pirate accent disappeared. Also, Galuf is clearly Captain Basch after getting bashed on the head with a rock. I'm only partway through the game -- I need to head off to Crescent Island to collect my next plot coupon -- but it's a fun diversion. I'll play VI when I'm finished so I can finally enjoy the game which so many of my Old School Gamer friends seem to recommend.